You can keep your Matt Smith. Tennant is my Doctor. 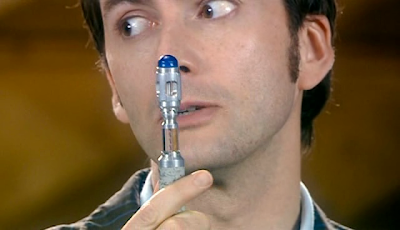 Have you ever wished you had a sonic screwdriver to open locked doors or drop Cybermen in their tracks? Radio Times is reporting that researchers at Dundee University in Scotland have created the real deal: a machine that can use ultrasound waves to flip over a rubber disc floating in water. Scientists consider this is step up from the ultrasound tools already in use because of the increased level of control over where objects go, and they hope it will be used for non-invasive surgeries and drug delivery. Read more at Radio Times. Of course, if you just want a sonic screwdriver for less medical and more flashlight-based reasons, ThinkGeek has you covered. But that's not the only cinematic devise that's materialized in our universe. Yes, but do the snozberries taste like snozberries? An elevator in London has installed lickable wallpaper, a la Willa Wonka's chocolate factory, according to a Laughing Squid article. 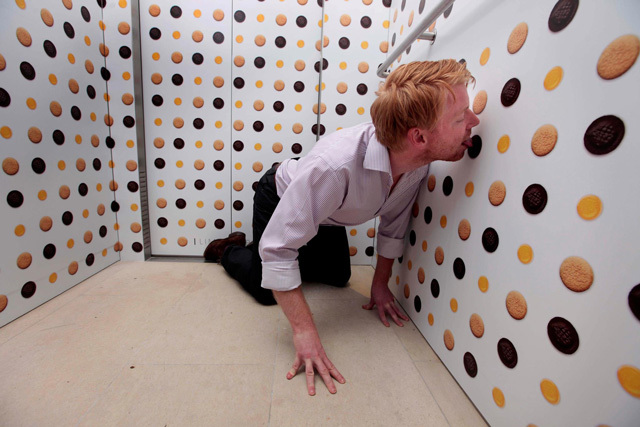 Communications company Engine has papered one of its elevators with 1,325 cookies that passengers can, well, lick. No worries, though; once a cookie is licked, a bellboy tosses it and replaces it with a fresh one. You can read more at Laughing Squid (and take a gander at slightly fetishy photos of pretty women licking cookies on walls). I'm not so sure that's an elevator ride that I'd want to take. How about you? 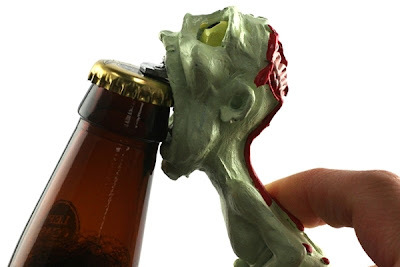 Next, I assume no well-stocked kitchen can function without this zombie bottle opener, available from Neatoshop. Because let's face it: Aiming for the head is thirsty work. Finally, if you're looking for a pick-me-up on your Friday afternoon, I present you a link to this classic Cracked.com article: A Series of Emails from Cyberdyne's New Tech Guy. It's not new. It's not timely. It is, however, hilarious and something I reread every few months. I dunno ... something about the tech guy asking, "Did we switch over to robot monsters?" never fails to make me laugh. Out loud. At work. Here's hoping you enjoy it, too! There is no way I could ever lick the walls of an elevator. Funny, though. 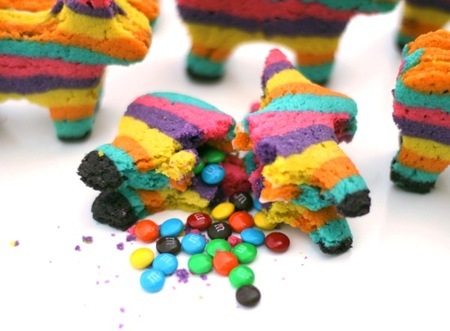 I love the pinata cookies and the zombie bottle opener. And the Cracked article was hilarious!